If you believe in kindness, thoughtfulness, and love for a pet, then this update is for you. 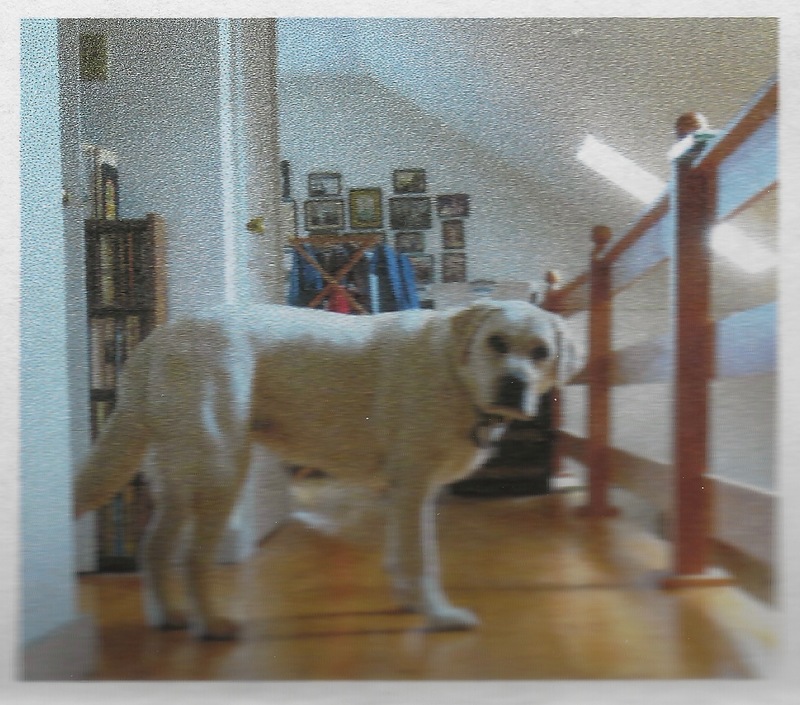 A few posts ago, I shared a good-bye love letter from Lizzie, our lab of five years. The letter was written in first person, Lizzie, who wrote to her ‘new family’ sharing a thing or two about her upbringing as well as explaining how and why she needed re-homing. HERE is that post. The other day, in the mail . . . none other than a letter from Lizzie! We took a long trip early on to a place on a lake in Pennsylvania. I had the whole back seat to myself, but it was the back seat of a pick-up truck. Ugh! I fussed and whined the entire three hours down, but slept for at least a bit on the way home. I wasn’t interested in going swimming, but it was fun to wade and to gather sticks from the embankment of the shore – and chew them of course! Ann has begun to take me for rides in the car. (MUCH better than a truck!) We’ve gone to the post office a couple of times and once for a quick trip for groceries. I’ve been very good about staying in the back seat and “waiting,” but I still let them know that I don’t like being left alone. I don’t bark, but I do whine and yelp to register my annoyance. One of my jobs here is to be a four-footed doorbell/ I take that very seriously. Sometimes I still bark when Scott comes home. Once, when he was “dressed up,” I really didn’t recognize him. They tell me it’s OK to make an announcement, but that I have to work on curbing my enthusiam; this is TOUGH. One more thing. Last week they gave me some medicine on my back to fend off ticks. I didn’t even notice it at first, but after a while it went to my head. It was like I was high on drugs (which I was actually). I couldn’t settle down for nearly a day – even during the night-and panted and whined and roamed around all over the place. What a bummer. Ann and Scott thank you for sending me with a letter of introduction. They hadn’t had a dog for several years and needed to be filled in on dog tricks, including some of my own. They still remember my predecessor (who also was a yellow Lab because I see her photo above the desk) and sometimes call me “Ida.” But they’re learning! I miss you, but want you to know that I’m doing OK and will be just fine. I hope Dad is beginning to feel better. Thanks for giving me a good start! PS: I just learned that my step-brother and sister, Noah and Laura, will be coming to visit next week. They’re a lot younger so it will be fun to have somebody around with more energy! I am sharing to let readers know that Lizzie is obviously in good hands. Maybe, there is a lesson in this heart-wrenching experience. If you use your resources around you, place trust in others, and pray A LOT, something good may follow. That was so sweet for “Lizzie” to write to you. I’m sure you miss her (you know she misses you), but she sounds like she’s in great hands. I am thinking of you and hope things are getting better! I do wonder what she is thinking and do know her inquisitive nature and love for all will keep her happy. There was no decision in the matter and time will heal the broken heart on this end. We continue to be in recovery. Thank you, Michelle for your thought. Oh that is so nice! Not easy for you, I’m sure, but what a kind thing to do. Lizzie sounds and looks like she’s settling in well. I think animals understand a great deal more about their human families than most people imagine, and I’m sure she knows you didn’t want to have to give her up. I hope things are going along okay for you. Lizzie totally sensed something was wrong. I continue to miss her terribly but am very appreciative to know she has a new, exciting life and is doing well. So happy to know she’s in good hands. We had a similar experience last year when we had to find a new home for our little parakeet. He was part of the family, and the kids were so sad that we could not bring him to France with us. I did pray a lot to find a new home, and one morning thought of my massage therapist who had recently lost her dog. She was such a gentle soul, and sent us some news a few weeks after we moved. Our bird got depressed at first (that’s what the vet said as he was loosing a lot of feathers) but slowly got used to his new home. It was so important for all of us to know that he was well taken care of. It must be such a relief for you too, pets are living creatures that need as much love and care as we do. Thanks for letting us know. Pets . . . you can’t live with them (at times) and you cannot live without them. Yes, you indeed do have a similar story. So heart-wrenching. Holly, what wonderful people to write back to you & set your mind at ease. Sounds like Lizzie is living an exciting life! I am so happy it all worked out. I am thinking of you & hope that things are improving every day! Kelli, I am very appreciative of hearing that Lizzie is doing well. I was secretly hoping ‘she’ would write. I miss her terribly.